I am really enjoying Italian sentence magic. The production is flawless and clear. No problems whatsoever. Most important of all ... 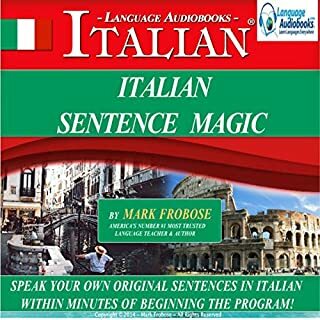 I'm getting great results learning to speak Italian. My in laws are from Rome, so I'm impressing them with some basic sentences already. They say I'm doing great. I've been looking for a good Mexican language program for a long time and I found it here. It made me reasonably conversational in real Mexican Spanish in just a few weeks of semi-intense study during my down time in the car and while working out at the gym. I liked the complete illustration of differences between Spanish speaking in Mexico compared to other Spanish speaking countries. No guessing, full explanations. Mark the narrator/teacher explains, along with some great Mexican Spanish speakers. I also learned a lot of common Mexican phrases Real bang for the buck on this program. Excellent approach that teaches the little-known nuances between standard and Mexican Spanish. No hassle or guessing, friendly narration tone. Instant translation from English to Spanish. 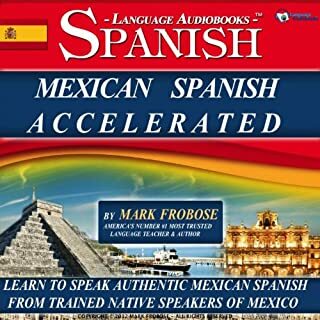 This program really bridged that nasty gap between slow Spanish as you learn it on audio and real Spanish spoken at native speed. 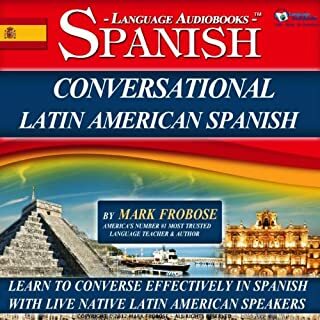 I also picked up a lot of conversation-based vocabulary in context for all situations, including but not limited to shopping, eating or traveling around in a Spanish-speaking country. The awesome native speakers really helped me to speak and understand Spanish spoken at native speed. All Latin American Spanish speakers. First slow, then medium speed, then blazing fast, just like in real Spanish conversation. Great way to learn Spanish within a reasonable period of time. Really enjoyable too. For me, a bargain for my time and money.